Do you see that fabulous poinsettia? It’s a builder punch in the new holiday catalog, and it makes a stunning flower. It also coordinates with the Reason For the Season stamp set. I love stamp/punch coordination! 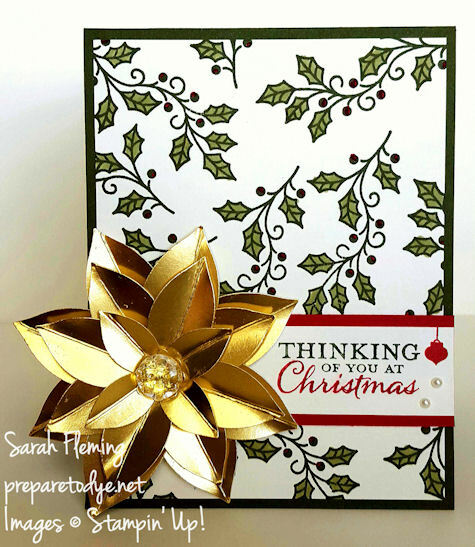 For this card, I decided to make my own designer paper using the holly from the Embellished Ornaments stamp set. I stamped it several times on Very Vanilla paper in Mossy Meadow. I colored in the leaves with a Wild Wasabi marker and colored in the berries with a Real Red marker then added the stamped panel to a Mossy Meadow card base. The red panel is Real Red. I inked the sentiment using Mossy Meadow and Real Red markers and stamped it on more Very Vanilla cardstock, then added the tiny ornament from the Among the Branches stamp set. A couple of Basic Pearls finish off the sentiment panel. If you watch all the way to the end, you’ll see how this punch can be used to make a variety of flowers, not just poinsettias. I scored my petals instead of just folding them. I don’t know that it made much of a difference, except that I always end up folding way off-center. 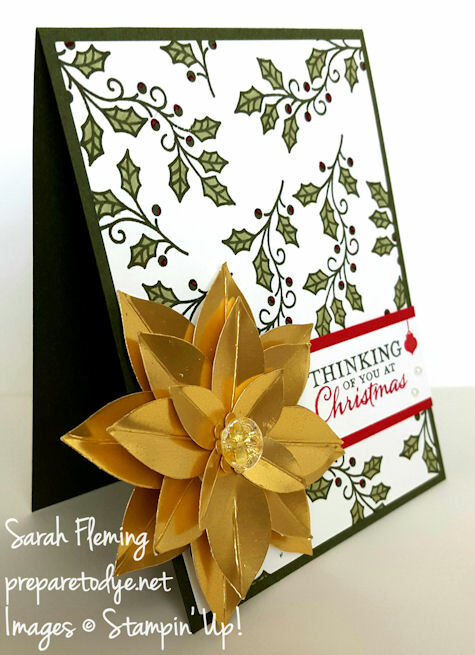 Since I made my poinsettia out of a Gold Foil Sheet, I did use Multipurpose Liquid Glue for most of the flower, but to glue on the Vintage Faceted Designer Button, I used Crystal Effects and laid the flower out to dry completely overnight before attaching it to the card. I find that the Crystal Effects holds things to the shiny papers much better than other glues. The holiday catalog is available now, so you can order everything you need to make this card from my online Stampin’ Up! store. Have a great day!